We often get asked to review various dog foods, and it can be difficult - I can't change Lottie's food every time I review a new food as that would be very unsettling for her tum, so all I can really do is give her a few bits to try and see if she likes it, and make my judgement on what the food contains (by the way, I donate any food left over to our local rescue, if anyone ever wondered!). Until now! 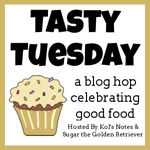 I was recently asked to do a review on Canagan Grain Free dog food, and was absolutely delighted to accept as this is Lottie's regular food as of a few months ago! Although they were very generous to compensate us with a bag of food, this is very much a review from personal experience. Canagan is a high quality grain free kibble, available in lots of different flavours including chicken, salmon and game. They also do a Light / Senior range, plus "Large Breed" kibble - bigger bites for bigger mouths! The food also contains other high quality ingredients, such as sweet potato, seaweed, and plant and fruit extracts such as marigold, chamomile and cranberry. All these high quality ingredients provide what is known as a "biologically appropriate" food, meaning that the nutritional breakdown closely mimics what a wolf would consume in the wild, with the correct ratio of meat protein, fat and carbohydrates. What are the benefits of a grain free food? Although some dogs certainly live long and happy lives on food containing grains (such as wheat, barley or corn), some dogs can exhibit signs of grain intolerance, for example bloating, vomiting or other stomach discomfort. Although dogs are better at digesting grains than their wolfie friends (five times better in one study), meat is much more digestible for them, providing a better nutritional source. In Canagan, carbohydrates are provided from sweet potato, a much more easily digested carb source, providing slow release energy, leading to stable blood sugar levels. 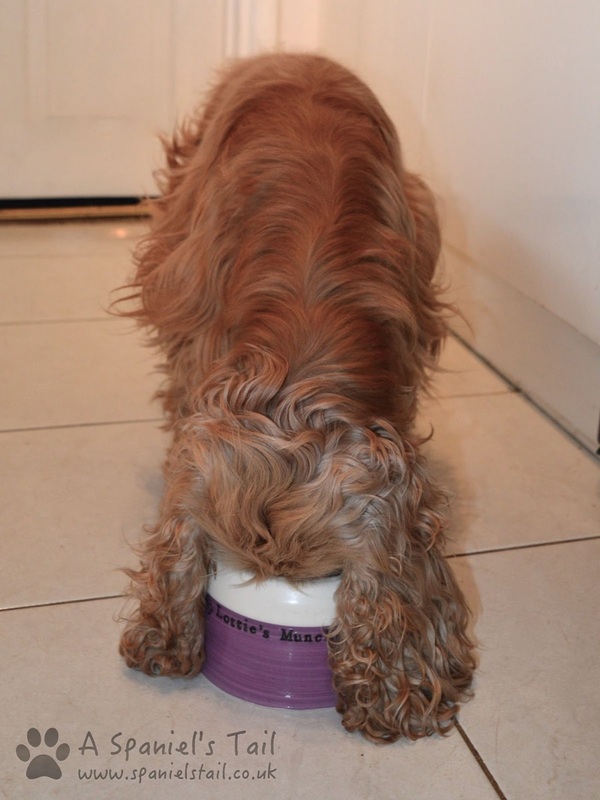 Plus it curbs hunger - great if you have a gannet of a dog like me! Lottie has been on Canagan for a few months now. She was on grain free from around 13 weeks old, which was an 80:20:0 mix (80% meat, 20% fruit and veg, 0% grain). Although it was a good food and I would never say anything bad about it, it was always....not quite right. With any grain free, high meat kibble, I have found it is real trial and error to get the exact amount right, otherwise a little bit too much can be too rich for them. A few months ago, a friend recommended Canagan (in fact, she used to use the same food I did previously), as being slightly less rich, on a 60:40:0 ratio, so off I popped to our local pet store and grabbed a bag to try. I am delighted I did - I still weigh out Lottie's dinner accurately, but her poos are firmer, she is happy, healthy and energetic, and most of all, she absolutely loves it! For anyone who might want to know how I changed it over, it took five days (Lottie is normally pretty good) of upping portion of Canagan by 10% each meal (obviously reducing previous food by 10% at the same time). I would like to try game and salmon ones to see how she fares with those (the game is 65% meat, and the salmon 60%), but I have absolutely no regrets about changing her on to it. 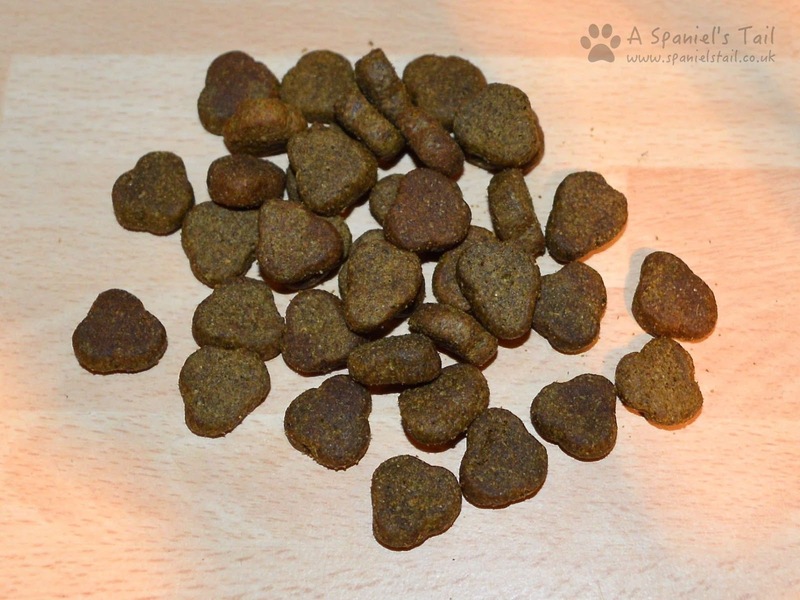 It is one of the pricier foods out there, at £59.99 for 12kg, but as it is so nutritionally dense, your dog doesn't need as much as some foods. Lottie has 130g a day, which works out at 65 pence a day! So yes, I can highly recommend Canagan - although I would love to do more raw feeding, I simply don't have the freezer space at the moment, so I like to ensure I feed her the best quality kibble I can. I do supplement occasionally with the odd raw chicken wing, egg, sardines etc. In fact, three other dogs we know are now on Canagan, so starting a little Canagan Club! Top marks Canagan, we will be staying with you for the foreseeable future. 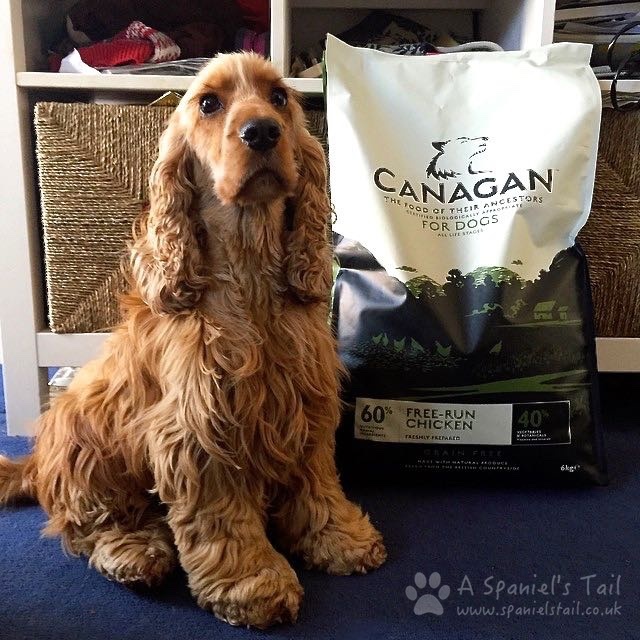 Canagan were very kind in sending us a free bag of food, but Lottie has been on this food for four months, so this is very much our honest opinion! To order direct from Canagan, visit their online store here. We love hearing from Lottie! She looks so much like our old Charisma! The doggie food looks yummy.